Simple lunchbox ideas including a recipe for an easy trail mix your kids will love is just in time for back to school! August has always been a “summer” month living in New York. School doesn’t start here until after Labor Day so when I hear all this back to school mumbo jumbo from people who live elsewhere this time of year I’m totally baffled by it. In my head, August is the hottest month of the year and should be filled with pool parties, ice pops, watermelon, late-night fire-pit s’more making and all other end of summer things for kids, not alegbra and homework. That said, I’m realizing the Northeast is in the minority and pretty much the entire rest of the country considers August a “back to school” month. So, begrudgingly, I’m going to talk about simple lunchbox ideas for you guys today. I have to say, putting this lunchbox together almost (a very big almost) made me want a kiddo to do this for, it was fun! Lunchboxes have come a long way since being a kid of lunchbox appropriate age in the late 80s. The multi-compartment ones like this make it so much easier to pack a bunch of stuff without having to worry about the sogginess factor. Piecing this lunchbox together was like tetris for my brain. Wanting to get in a nutritious meal with protein, carbs and fats all represented in a fun, easy and balanced way and most importantly, so a kid would actually eat it was way more enjoyable than I thought it’d be. As you can see, I took a little help from two of my favorite organic brands, Horizon and Santa Cruz Organic that I picked up at Target. 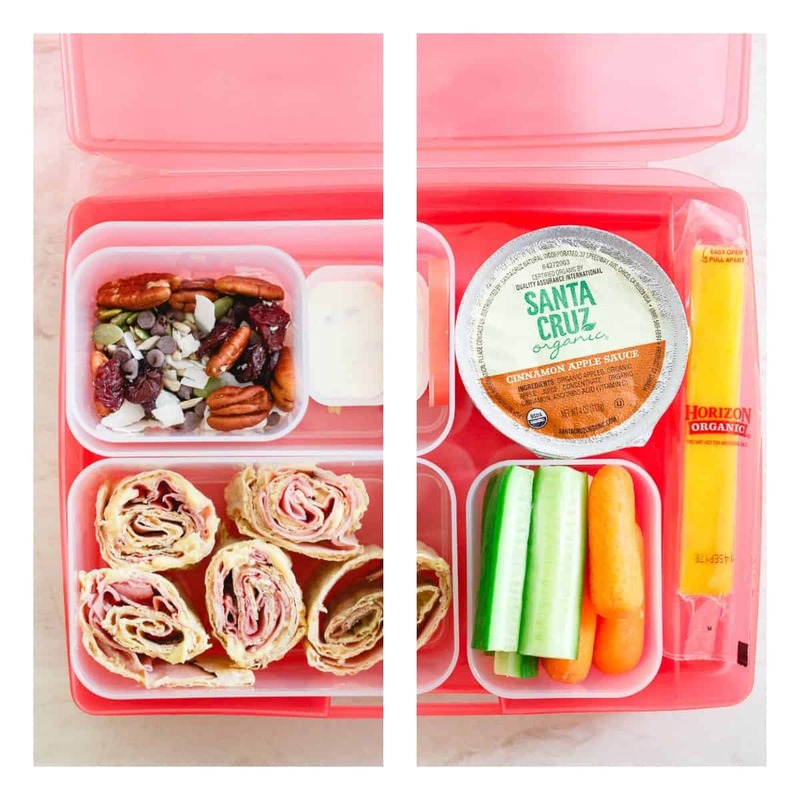 Both were perfect additions to this nutritious lunchbox from a parent and kid perspective. Save 20% on Horizon with Cartwheel and go in-store for savings on Santa Cruz Organic 8/6/2017-8/26/2017 to stock up on back to school lunchbox essentials! Cheese sticks have been a long-time lunchbox hero and the single serve colby cheese sticks were a fun change up from the traditional mozzarella variety. The cinnamon applesauce cups won me over because there’s no added sugar in them. Apples are plenty sweet as is, it always drives me crazy to see unnecessary added sugar in applesauce. Plus, if your kid is going to eat sugar, I’m going to go out on a limb and say they’d much rather it in a handful of chocolate chips in their trail mix than in the applesauce cup! Because I’m a firm believer that every meal should end with something sweet, I included this easy lunchbox trail mix. The recipe below is for 1 serving but making a big batch for the week and portioning it out each day is a great idea too. With heart healthy fats from nuts and seeds and a little sweetness from dried tart cherries and mini dark chocolate chips, it’s the perfect way to end the lunch hour and get energized for the rest of the school day! Love this simple lunchbox idea? 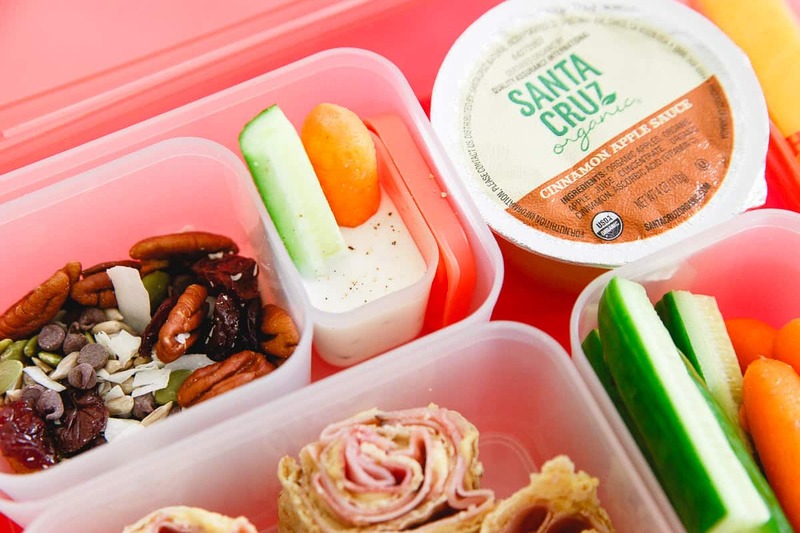 Check out these snacks for more simple lunchbox ideas: no bake peanut butter chocolate chip balls, chewy tart cherry oat bars, cranberry orange oatmeal cookie bites. Mix all ingredients together in a small bowl and place in lunchbox container. I’m always looking for good lunch ideas to mix it up!! Thanks for that! Do you ever make your own hummus in different flavor varieties? Thanks for the inspiration, my boys would love this! Great ideas Gina! Love the trail mix too. Hate it that it’s almost back to school time! 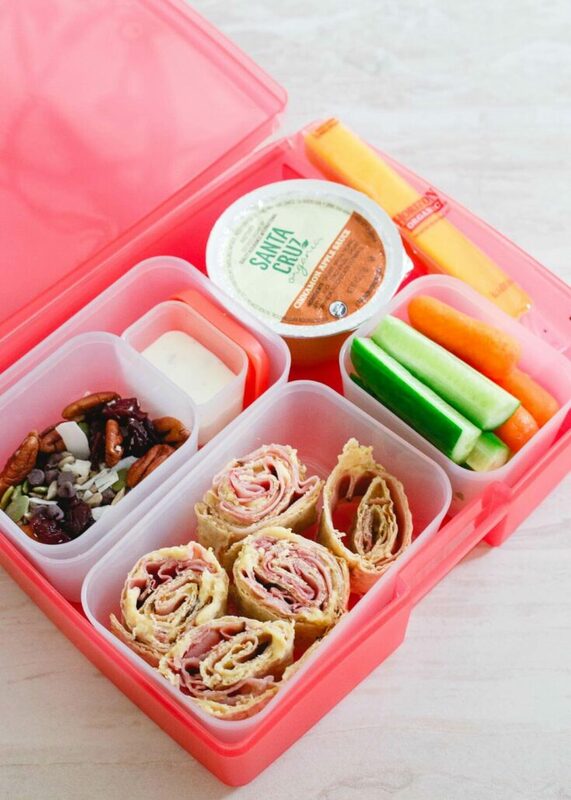 I am ALWAYS looking for new pack-able lunch ideas…these are so great! Love that trail mix too! I wish my lunch boxes had been this yummy growing up! Loving these fun ideas and this trail mix! My kiddos aren’t in school yet, but I’m always packing lunches to take on our adventures. These are some great ideas! I get so sick of the same old sandwich routine. 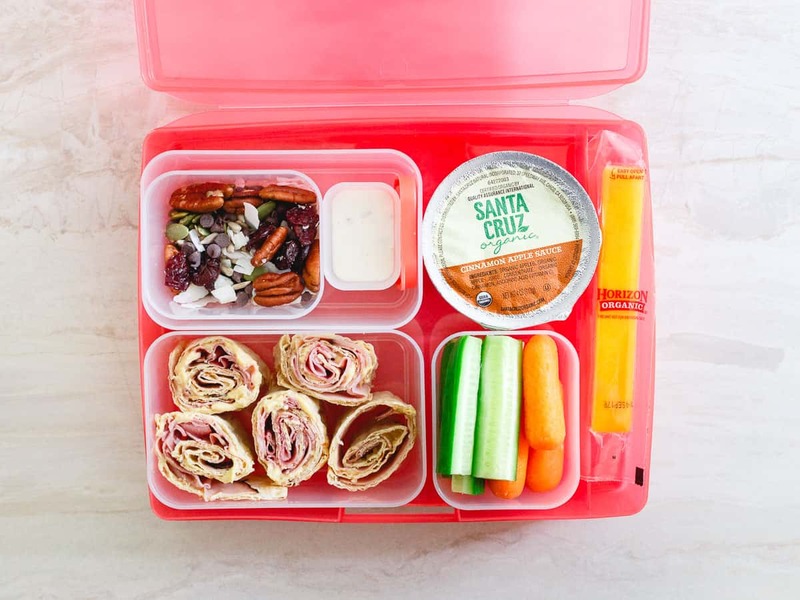 I love everything about these lunchbox ideas. Those wraps are calling my name. What a great lunch box! We are big fans of Horizon!